Mauritius has caught the eyes of foreign property buyers far and wide thanks to the island’s blissful marriage of economic stability with a mild tropical maritime climate. Over the years, numerous property market reforms have opened up the sector to investment, much to the delight of real estate purchasers from South Africa to Europe. Today, the island’s top developers are now constructing their portfolios with Chinese buyers in mind. The prospect of foreign investment in Mauritian property is relatively new. Before reforms were introduced in 2004 through the Integrated Resort Scheme, foreign ownership was prohibited. In 2007 the government of Mauritius followed up this initative to draw in more investors with a second installment: the Real Estate Scheme, which allows foreigners to buy properties starting at $300,000. They even included a Golden Visa-esque clause that entitles foreigners to a residency permit with a minimum investment of $500,000, as well as the ability to apply for a Mauritian passport after five years of maintaining the acquisition. The schemes worked magic. 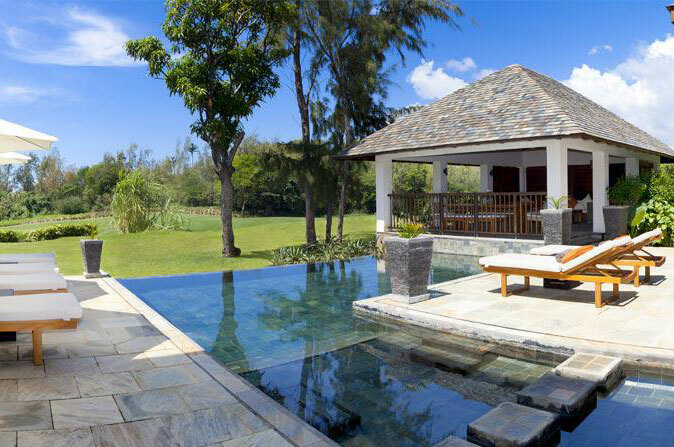 Since 2007, the number of millionaries living in Mauritius jumped 160 per cent. The fact that Mauritius was closed to foreign property investment previous to 2004 had spawned a large pent-up demand, the island’s leading property developers say. “Investment in property is today one of the main channels for foreign direct investment in the country,” observes Patrice Legris, CEO of Alteo Properties, a luxury real estate developer, and owner of the Anahita estate, a renowned 213-hectare resort on the island. “These investments come mainly from Europe – including the UK, France, Belgium and Switzerland – and also from South Africa. Although we still have relatively few investors from Asia, this region represents a huge potential for us in the future,” he adds. For Legris, the new opportunity for foreigners to take a stake in a piece of Mauritius’ tropical para- dise has been a cornerstone of the market’s allure. Alteo Group owns a land bank measuring 15,000 hectares, and plans to utilize these grounds to construct pioneering new real estate projects next to Anahita. “We plan to innovate through new architects that will create sig- nature villas,” announced Legris. “These villas will employ high standards and exclusive specifica- tions for our construction works that don’t exist in Mauritius. All these houses will be automated and modern,” he said, adding that the developments will change the face of the real estate sector for the nation. Meanwhile, the island’s property offerings are diversifying, includ- ing a landmark mixed-use smart city development. “The Mon Trésor Smart City is the first ever project in Mauritius to obtain the government’s Smart City certification,” said Jacques d’Unienville, CEO of Omnicane, the project’s developer and one of the country’s top conglomerates. The new property venture, Omnicane believes, will be only the beginning now that the sec- tor has supportive legislation in place. “With the smart city scheme and tax incentives, new opportuni- ties have emerged and the scope of the property market has resolutely leapfrogged to new horizons,” said d’Unienville.